Well, I know I'm a few days late but Patrick is now 1 Month Old! This very cute picture was sent to us by our good friends Mark and Megan. The beautiful little girl (and possibly Patrick's future girlfriend) is their daughter (and our Goddaughter) Nora. Patrick turned 1 month old on 08.08.08. I think China threw him a big party that day with a bunch of drums and fireworks and a gigantic birthday candle or something. They seem like nice people. So, if you're reading this China - thanks! We took Patrick in for his 1 month checkup and he weighed in at an even 10 lbs. and is 21.5 inches long now. Patrick also decided to have his own Olympic event last week. He rolled over 3 times! It was, of course, completely on accident but still fun to see nonetheless. He started on his tummy and then managed to get his left arm stuck under him and in an effort to get his mouth to his hand, flipped onto his back. Then did it two more times. Oh my gosh, that's awesome. I love the way he victoriously pumps up his fist, with the most determined look on his face. He is so freaking precious. Seriously, in love with this baby. Such a cute video! He's already getting so big. I just loved your last post about Angie too. 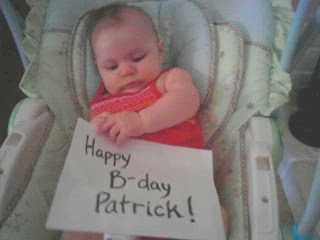 Bawling like a baby at my desk...thanks a lot =) Give Patrick a kiss from his Aunt Reba. WOW that was sooooooo cool!